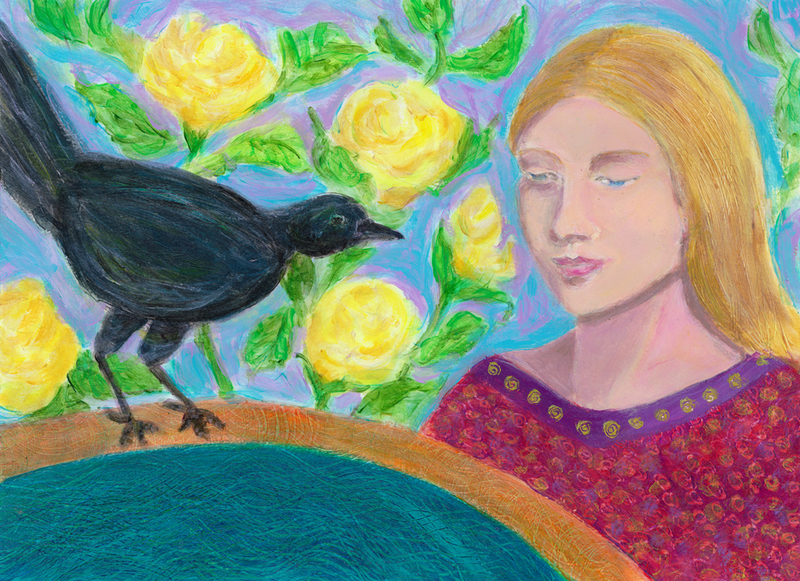 Robin Among the Dogwood Flowers is a new painting for my bird series. It seems that around this time of year I’m usually inspired to paint spring scenes. Spring here in Atlanta is breathtaking and each day brings new colors as the various plants awaken. In the past few weeks the dogwoods are taking their turn with their bright white flowers lighting up the landscape. The robins are back in the hood. Last week a robin landed just outside my kitchen window where I had long close up look at him. Right then I decided it would be fun to paint a robin. One thing I love about painting is that it helps me to observe more closely the the world around me. On my walks through the neighborhood, I focused on observing the robins and dogwoods as I worked on this painting. Robins symbolize renewal and hope as they are one of the first birds to return in spring. Some Native American tribes saw the robin’s red chest and bright yellow break as a symbol of the dawning of the sun. The yellow beak symbolized the rays of the sun and when seeing a robin it was a sign to speak your highest truth. Today is the first day of spring break for all the kids here Atlanta, late last night storms came through helping to wash the pollen away. I hope everyone enjoys this upcoming weekend. On twitter the other day, someone asked the question, “What are some of your earliest Christmas memories?” which got me thinking. One of my early memories, so early that to me it seems dreamlike when I think about it, was riding the Pink Pig at Riches department store in downtown Atlanta. I must have been 3 years old. My twin sister and I probably rode it with my two older sisters while my parents shopped. The Pink Pig ride was up on a railing that went around the interior of the store, we could look down and see the shoppers below. Afterwards we got to visit with Santa Claus and then onto a red room where we picked out small gifts for our parents. The spring after this experience our family moved to Columbus Ga. Every year at Christmas, my older sisters would tell us that the “real” Santa was at Rich’s in Atlanta, which of course I believed. A while back I had showing of my art work at the Phoenix and Dragon bookstore in Sandy Springs titled, “When Pigs Fly”. At the opening I was asked why I painted pigs. During that talk I remembered and realized that the Pink Pig memory was probably a big unconscious reason why I had chosen to paint pigs. The painting above is called “When Pigs Fly” and it reminds me of the magic of this season. Wishing all a very magical holiday season!